Let's get the birthday party started, Okurrr? 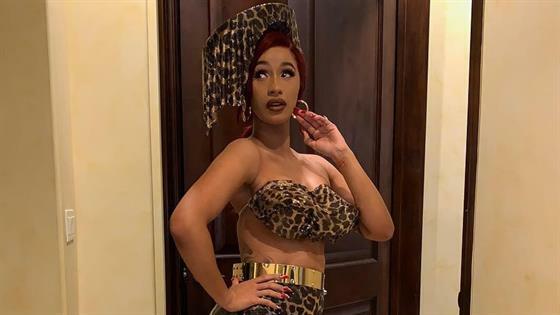 Cardi B turned 26 on Thursday and celebrated this weekend with husband Offset and family and friends, including celebs such as Kourtney Kardashian, at a surprise birthday bash at the Beauty & Essex lounge in Los Angeles. The birthday girl wore a pink and white Moschino spring 2019 ready-to-wear wrap dress with the outfit's corresponding hat and tights embroidered with black scribbles. The party started late on Friday night and continued into Saturday morning. 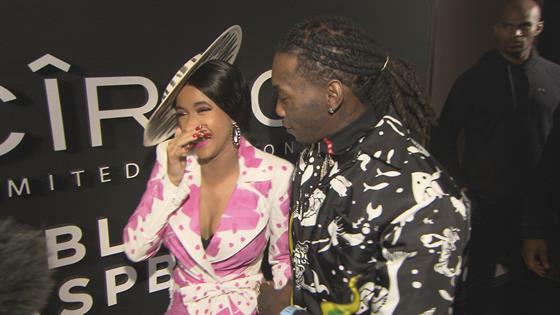 Cardi and Offset arrived just before 3 a.m.
"Oh s--t!" Cardi said as Offset led her upstairs to the bash and guests screamed, "Surprise!" Her sister Hennessy Carolina, who posted a video of the moment on her Instagram Stories, and her mom then greeted her and guided her through the crowd. The women and Offset then headed to a table, which guests quickly mobbed, prompting club workers to get on a mic and tell the crowd the back off as the music was stopped. Cardi-themed drinks, including the "Bardi Martini", "Black Rose," "#26" and yes, the "Okurrr," were served. Guests sat on couches with pillows emblazoned with a "Cardi B" logo, which was also displayed on a video screen. Celebrity guests included Kourtney, her friend Larsa Pippen, her sister Kylie Jenner's ex Tyga, EJ Johnson, "Hot Felon" and model Jeremy Meeks, designer Jeremy Scott and rapper G-Eazy, who attended the bash with two male friends. Big Drip 💧Cardi dressed in @moschino SS19 lastnight for her surprise Bday party! Shoes by @casadeiofficial #styledbyKollinCarter special thanks to Brooke and Jeremy for making this look happen I harassed you guys for it and you made it happen! "Happy birthday to my beautiful wife, you know what I'm saying?" Offset said. "God is good. We just had a beautiful daughter, Kulture. We just had a daughter so I got you this little gift." He then presented Cardi with a diamond necklace and matching bracelet. The necklace is made up of approximately 150 round brilliant 1/2 carat diamonds, with the letters "KULTURE" spelled out twice in pave diamonds, with each letter comprising of about 1 to 2 carats. The total weight of the piece is between 80 and 100 carats and the necklace costs between $250,000 to $300,000, according to Andrew Brown, President of WP Diamonds. "Oh my God! This is too much!" Cardi B exclaimed after receiving the gifts. Larsa posted a video of the two. Cardi also received a Rolex watch from a friend. Offset also gave Cardi a bouquet of six dozen roses, courtesy of Butterfly Floral. Kourtney and Larsa, accompanied by security guards, had arrived at the party around 12:45 a.m. via a side entrance. The women sat in a corner booth with a male friend and posed for selfies. Around 2:15 a.m., after alcohol service had ended, Tyga arrived and asked where he could get a drink. He and Kourtney were not seen interacting. Tyga, who was not served any drinks, left the bash just after 3 a.m., right after Cardi B showed up. Almost 15 minutes later, Kourtney and Larsa left with their security guards. Cardi and Offset were later spotted dancing at their table together. Cardi left the party hungry but happy. "My hubs told me he was gonna take me out to dinner and I appreciate the surprise birthday party and all that but I'm f--king hungry right now," she said on Instagram Stories, in a video showing her wearing her new diamond necklace. "I'm hungry but I'm so happy."